As you’ll see from the photos below, this is a new composite deck replacing an old, worn out wood deck. Our client came to us looking for a solution for their back deck. The old on was about 12 years old and the decking was on its last legs. The wanted to upgrade to a bigger deck with lower maintenance in mind. After showing them a few samples of different materials and go over the pros and cons of each line of decking they chose to go with Trex Transcends exotic decking. The color name of the one they chose is Spiced Rum. Because of the choice of composite we were easily able to provide a long lasting deck with a hidden fasteners system for an even nicer look. The wrap around step is support entirely by a concrete footing for strength and durability. The decking itself has a multichromatic finish to give a more natural and not so stark coloring. This deck with its large layout, detail rich decking, hidden fasteners and strong support will be able to be enjoyed for many years by the owners of this home. Designing is one of the most important steps to take for any remodel project. Having 3d design of your project not only allows you to see the future but also helps to anticipate problems. As with any project, having a clear plan makes for a smooth project, and having your project drawn in 3d makes for a clear plan. As you can see in the pictures on this post, the drawings give you the ability to see the new bathroom from any angle as well as allowing for more accurate space planning. You also have the ability to see materials and colors as they would be in the new space. The advantages to having a 3d design drawn of your remodel as opposed to traditional elevations and cross sections, gives everyone a clearer picture of what your getting and makes communicating it much easier. 3d design drawings are a must for any remodel or any project. Here are a couple photos of 2 cedar decks we built on a house. The deck is framed with pressure treated lumber and decked in cedar. These decks were rebuilds from the original treated decks built when the house was new. We manufactured the handrails in our shop and pre-finished all the wood as well. This made for a low impact on site installation and no finish was required once the deck was built. The other advantage to building the handrails in the shop was being able to set up a system for assembly which saved time (money) and increased the ability to deliver a higher quality product. These decks are stained with Sikkens oil stain with a cedar pigment. With proper care and maintenance these deck should last for many years to come. Below are a few pics of a composite fence we recently completed. The fence is 6′ tall and runs approx. 170′. This fence is located on top of a large hill so high winds are a regular issue the h0meowner. To address this issue we built the fence with 6×6 pressure treated posts with a minimum of 120 lbs. of concrete at the base of each post. The ground here is very rocky so its very stable, if I had softer soil I would be adding at least another 60 lbs per hole. The framing of the fence is all pressure treated lumber with the rails being attached the the post by means of a Simpson tie fence bracket (FB24z). The composite fence is Fiberon brand and is attached to the framing with 1 1/2″ galvanized staples. The completed fence looks great. Using a composite material for fencing is a great way to go. It gives you a long lasting, very nice looking, easy to maintain fence. The cost of the fence is definitely paid off by the longevity. Get a composite fence for long term performance and ease of maintenance. Today I’m posting about using space outside your house increase your usable area. As you will see in the pictures this is not so much about entertainment space as it is about work space. On this project we took an inside corner and made it into a small work area protected from the elements. Using the two existing walls of the house we were able to create a sheltered work area outside with very minimal impact on the rest of the yard area. We built the roof to mimic the other roof slope on the house and then put in a concrete walk from the back door to the work area for year round, mud free access. Since there was already an exterior light on one of the walls it made it easy to change the fixture and gain extra light. We also poured concrete for the floor of the work shed area. 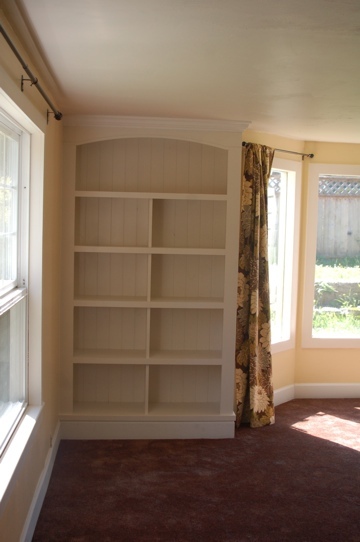 Why take the time to get bookshelves built custom? Get exactly what you want, get them to fit a specific space, and get a higher quality, longer lasting product. 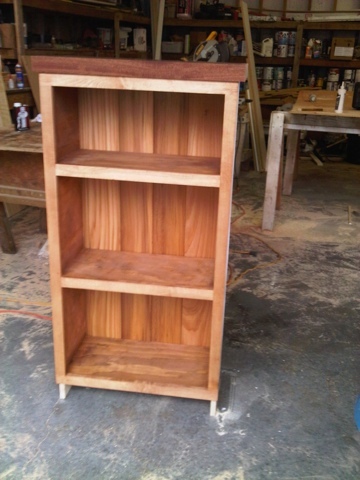 Here are a few pictures of custom bookshelves built one of a kind for specific areas in these homes. Custom cabinets can be built to specific sizes to fit items in with the best use of space. Here is time lapse video of a laminate floor installation we just did. This project involved removing the old carpet in the living and dining rooms as well as the old laminate and vinyl in the kitchen. A laminate floor is a great choice for most any room. It work great in your house except in bathrooms with showers or tubs. You can even install these types of floors in your basement or garage if you use a proper vapor barrier. The choices for laminate flooring are quite large, coming in most types of wood looks. Laminate flooring also holds up well to pets, especially dogs. One of the important things to look for when getting laminate flooring is to get a quality pad. The right pad goes along way in muffling the sound you would have if no pad or a cheap pad was installed. We use sound muffler pad in all the floors we install. Here are a couple photos from the completed remodel project we did in Des Moines. This project involved replacing the walls, ceiling, floors, countertops and base trim. We also redesigned the fire place area to make it the vocal point in the living space. 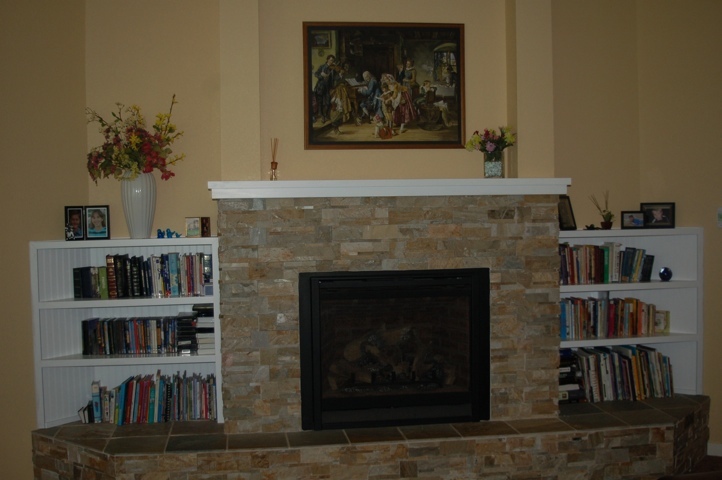 The rock around the fireplace is a multi-colored slate with a stained hemlock wood trim wrap. The countertops are granite with a single slab cut and placed on the old table to match the rest of the kitchen countertops. All the walls and ceilings were removed and redone with new drywall and texture. The floors are a hickory laminate floating floor. There are also new light fixtures by the fireplace and in the kitchen. The changes on this house make it a warm, inviting and comfortable place to live. I know the new owner is very happy with these upgrades. 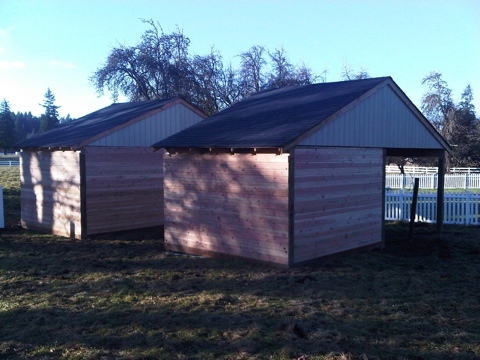 Here’s a couple of photos of horse stalls we built for a customer. This project was fairly unique because the home owner called once she had purchased the materials and had a general design in mind. 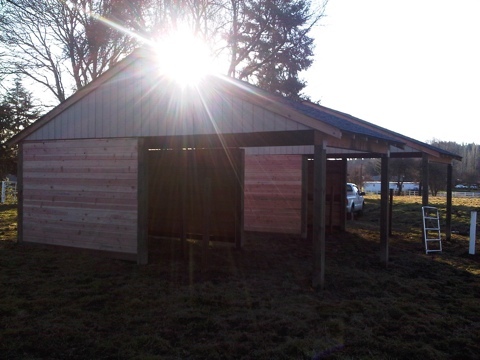 We built the stalls using a simple post and beam structure with scissor trusses to frame the roof structure. Tongue and groove doug fir was used to form the walls. The homeowner plans to continue building and adding to the stalls and will have a very useful and nice area for keeping her horses.